I noticed a blog post is way overdue. Please forgive me, I’ve been super busy. “What have you been up to?” you ask. Well, unfortunately, no new games from Napland Games itself (though I have many in the works), but I’ve been involved with a bunch of cool projects that have kept me quite busy. My main project right now is called vuzop. 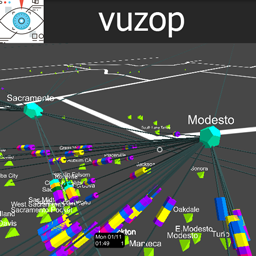 It is a virtual reality data visualization tool. It can read in data from a database and create interactive visualizations where you can fly around to explore the data as it moves in real-time, sped up, or slowed down. It’s target toward enterprise, but could be used in a variety of fields to explore data in a new and exciting way. You can see a demo video and more info at vuzop.com. Another fun project I’ve been working on is Eddie The Yeti. 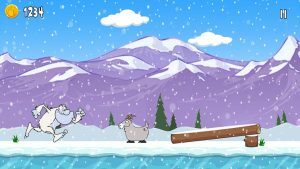 A cute endless runner with beautiful Hannah-Barbera style characters. It’s been released on Google Play, but we still have plans for more levels and features. Play it here. Beyond that, I’ve started focusing on tutoring Unity 3D a few months ago. I’ve had quite a few students making a variety of interesting projects. It’s very cool to have a chance to see the ideas of fresh new developers. And it keeps me challenged and on my toes. Every session there seems to be a new challenge that I need to find a quick solution to. I’m really enjoying it. Soon I hope to offer group classes. The syllabus for the first 12-hour class is done, but there’s still a bit of work to do! In the meantime, I’m re-dedicating myself to writing blog posts on a more regular basis. It’s easy to fall behind! I was writing for Clean Source Code, but unfortunately, the site owner could not continue to pay his dues and I did not have a chance to salvage my posts. And regrettably, the Way Back Machine didn’t catch the site and archive it. So I’ve been a bit discouraged by that. Enough of my excuses. Expect more posts soon!